This is the third in a series of conversations about dahlia-growing with dahlia guru Bill McClaren, author of the Encyclopedia of Dahlias from Timber Press in Portland, Oregon, and a noted dahlia hybridizer. Bill and Lois McClaren have introduced more than 150 new dahlia varieties from their Alpen Gardens in Kalispell, Montana. 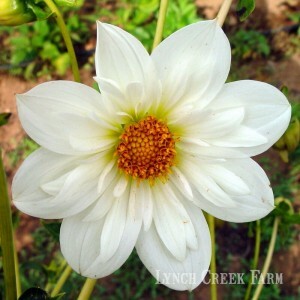 Lynch Creek Farm: Bill, you mentioned in an earlier conversation that when you began growing dahlias, you depended upon chemical fertilizers. Is that still your practice? McClaren: No, it's not. I would highly recommend anyone growing plants to grow them organically. To do this one must have healthy soil that is teeming with microbes. 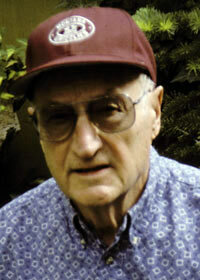 I started organic growing in the early '90s. LCF: Why did you switch to organic gardening? McClaren: We did not think all the chemicals I was using were healthy for our family. Actually, that was Lois who came to that conclusion, and as always, she was right. Since switching, I grow better dahlias with less insects and in th same soil year after year without any effect on the dahlias. There are a number of excellent publications on organic gardening on the market for anyone interested. It took me several years of experimenting before I saw success. Since that time I have continually improved my practices so that I am convinced it is the only safe way to grow dahlias. LCF: Will you talk a little more about organic dahlia-growing? McClaren: Organic growing is a total way of life. It is not possible to grow organically part way. You need to be convinced that it will not be possible to use chemical fertilizers, herbicides, or chemical insecticides in any way. No more weekly spraying, no more chemical fertilizers, and beginning a no-till soil system. The first year growing organically will be a disaster. It improves somewhat the second and by the third year you can breathe a sigh of relief and begin to see a difference. Read everything you can on organic growing, especially the newer organic books, and also Teaming with Microbes: A Gardener's Guide to the Soil Food Web. LCF: Are there specific techniques you use? McClaren: I practice no-till gardening. With no-tilling, you do not bring up the seeds that are in the soil so that helps. I also use white Dutch clover between the rows and this controls many weeds since they can’t get started in the shade of the clover. I also use lots of mulch: grass clippings, alfalfa hay, compost. They all keep weeds under control. It does take time, usually several years to see a great improvement. If you give this serious thought you should be ready to switch next year. Good Luck.